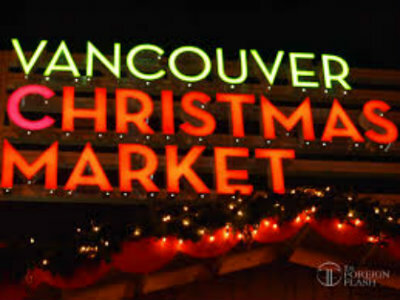 For only $5 you can enjoy the German-inspired Christmas Market at Canada Place and see what it has to offer. Add one dollar, and you get a season pass that allows you to enter any day and time. There are stalls with German food like Schnitzel and Bratwurst, as well as Spanish Paella and treats like Churros and fruit covered with chocolate. Have you ever eaten Spaetzle? If not, it’s about time to try! It’s a food lover’s paradise! Not to forget the mulled wine and other hot drinks that you can get there. Just like in Germany you can stroll along the different booths and let yourself get inspired by jewelry, clothing, self-made honey, beer jugs from several German cities, soap, Christmas ornaments and much more. You may find some Christmas presents or even something special for yourself. While we were enjoying mulled wine, we listened to live music, which was lovely and very Christmassy. We already went there at 3:30 pm and didn’t have to wait longer than 5 minutes to enter. But when we left at around 6 pm the queue seemed endless. It’s unsurprisingly a popular place to go to this time of the year, and I enjoyed everything the market has to offer. Interested in TOEFL? Get more information about taking a TOEFL test in Vancouver!